Your community can rely on Tributaries to provide a stormwater maintenance service to keep stormwaters ponds functional and healthy. may look tropical but they are actually native commonly found in freshwater wetlands. With its 6-12'' flowers ranging from burgundy to pure white it is hard to ignore. 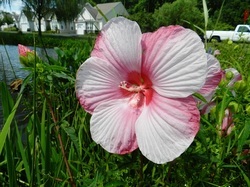 Hibiscus love to be wet and thrive if planted on a pond edge or in a stormwater basin. 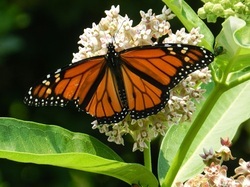 Monarch Butterflies are attracted by plants in the genus Asclipias. Featured is Common Milkweed (Asclipias syriaca). Delaware and the eastern shore of Maryland have two other common Asclipias species. Butterfly weed (Asclipias tuberosa) has long lasting bright orange flower clusters throughout the summer, it is trouble free and deer proof. Swamp Milkweed (Asclipias incarnata) has brilliant pink flower clusters and it's love for water makes it an excellent addition to stormwater basins. Through tributaries, all of our yards and communities are connected to rivers, bays and oceans. Our community stormwater pond maintenance service is designed to promote clean water and a healthy environment.